Summary of today’s show: Fr. Roderick Vonhögen, a Dutch priest who is a leader in Catholic new media, joined Scot and Fr. Matt to discuss how he discerned his vocation to the priesthood as a Dutch teen at Lourdes, and how Star Wars and the isolation of his first pastoral assignment led to the creation of the premier Catholic new media apostolate in the world, SQPN. 1st segment: Scot welcomed Fr. Matt back to the show. Fr. Matt said this past weekend he was in Billerica for a young adult retreat, “Life is Good in the Holy Spirit” and then on Monday for the youth harbor cruise. The retreat is about moving deeper into the gifts of the Holy Spirit that we received at baptism and confirmation. In the middle of July they have their Witness to Truth high school leadership institute and in August the Witness to Hope middle school leadership institute. Institute is a misnomer because it’s really a lot of fun. It’s about getting to meet peers from all over the Archdiocese while going deeper into their faith. For the high school institute, they marry Steven Covey’s “Seven Habits of Highly Effective People” to elements of the faith. Today is the 60th anniversary of Pope Benedict’s ordination and in Rome is the special celebration of the imposition of the pallium on new archbishops of the past year. Today is also Cardinal Seán’s birthday. Wish him happy birthday tonight at the Cathedral during a Holy Hour in honor of Pope Benedict’s ordination. 2nd segment: Scot and Fr. Matt welcome Fr. Roderick Vonhögen to show. He is a priest of the Archdiocese of Utrecht, the Netherlands and CEO of SQPN. Some of our listeners may have met Fr. Roderick last year at the Catholic New Media Celebration here in Boston. Scot asked him about his journey to the priesthood. He never thought of himself as a priest as a child. He didn’t think of it as a glamorous or exciting life. He wanted to travel the world and experience new things. He’s always worked in media. As a child, he and his brother bought one of the first consumer computers on the market. When he was about 17 years old, he was one of the few young people going to church on Sundays and remembered fierce debates with his classmates. At the time, Pope John Paul II came to visit the Netherlands and it was a disastrous visit because, basically, he wasn’t welcomed. The criticism of the Church made him ask, if the Church was so outdated, why had it lasted for 2,000 years. So he started to study his faith and began to see the beauty and truth of the Church.He began to conclude that if faith was so important, he started to feel the pull of prayer and didn’t know how to do it. His father gave him an abbreviated version of the Breviary and he began to pray during the day. That’s when God saw the door open and Fr. Roderick felt God pulling him. He began to ask God to show him that God is real in order for his life to be changed and God took that invitation. His parents became concerned he was praying so much because it was so atypical. His parents were regular parishioners, but they were not welcoming to the idea of the priesthood for him because it was so counter-cultural. They did send him on a weeklong youth conference at Lourdes, France, and that was such an amazing experience, kind of like world Youth Day. There were 50,000 youth there and he finally found lots of young people like him. He was also introduced to Eucharistic Adoration there. He met many young priests, which he’d never seen. During that pilgrimage, he realized God wanted something from him, although he still had not thought of the priesthood. So he began to pray to Mary at the grotto in Lourdes and asked her to tell him. He told her that he would not leave until he got an answer. Around 2am, it suddenly dawned on him that he was to become a priest. There was no doubt in his mind. So he went home to tell his parents and they were shocked. From that day on, he had to continually convince his parents he was serious and it wasn’t just wacky idea from France that would go away. They sent him to their parish priest for whom he had an immense respect. The priest told him that if he had to choose again he wouldn’t have become a priest and said it wasn’t a good life. Fr. Roderick was shocked and felt sorry for him, but it didn’t change his mind. Since then other priests have confirmed him in his vocation. Since that experience in the grotto, he’s never had a doubt. Scot said in his life, he’s also been very direct in his prayer when seeking God’s will in difficult decisions. He’s also found that God has always answered his prayer in those circumstances. Fr. Roderick said God never lets you down, even if the answer is not always what you expect. Fr. Matt said it’s amazing that when you give God that time in prayer, He does speak to us in that perseverance. God delights when we come before Him in that way. Fr. Roderick said Mary played a significant role in his faith. She was the go-to person in his faith because he was a complete newbie in faith. Even the idea of praying to God was difficult. But praying to Mary felt so easy because she’s a mother and she knows how children behave and misbehave sometimes. He felt she could bring him closer to her Son.After all she was Jesus’ own teacher and guide. Fr. Matt pointed out how John Paul in his pontificate always pointed us to Mary, to go through her to Jesus. He asked how Mary helped him grow in his priesthood. Fr. Roderick said in his media work, Mary is his guide. She literally carried Jesus to the world in her pregnancy and at the wedding at Cana she was there to mediate the situation and bring people to Christ. In his media work, he tries to model that work in a Marian way. His job is to bring people into contact with Jesus. When he records a show or writes a blog post, he’s doing what Mary has done, bringing people to Jesus. 3rd segment: Scot said Fr. Roderick helps lead the Church in new media. He asked Fr. Roderick why he went into this work. Fr. Roderick said it goes back to his first pastoral assignment as a priest when he was assigned to a small, remote Dutch village. It was such a different life for him as someone who grew up in a city. There were little means of communication with the outside world and he felt very isolated from the world. At about that time, the Internet was becoming popular and he had been used to working with it at the university. So he got an early dial-up connection and started to notice that there was a huge community of Star Wars fan, which had been an ongoing passion of his. He’d felt like Luke Skywalker, stuck in a little village, dreaming of going out into the world. At the time George Lucas was working on the Star Wars prequels and he started to blog about it. He got many visitors to his website, up to 40,000 per day. Then people knew he was a priest so people began to ask him questions about faith related to Star Wars and he started doing pre-catechesis. He eventually got invited by Lucasfilm to go to San Francisco to visit their studios. And at a convention of fans, people recognized him as the Star Wars priest and he learned that people returned to their faith because of their contact with him. Scot said Pope Benedict has encouraged Catholics to move into the “digital continent” and use the elements of the culture to bring Christ to people. Fr. Roderick said you often just need a spark to kindle the faith. After his assignment ended in that village, his bishop sent him to Rome to study for doctorate in theology. While there, he encountered some people doing media training at the Pontifical Gregorian University, and he was told he could do a second study in social communications for free. After two or three weeks, he felt suddenly that this is what he needed to do. He was learning how to engage people and how to reach people who are not Catholic. His bishop gave him permission to change from his theology doctorate to just social communications. After 2 years he returned to the Netherlands in the village of Amersfoort, where he has 10 churches. That’s when he discovered podcasting, which is like radio, but you could download it over the Internet to your computer or iPod (or when they became available years after, iPhones). at the time he received an invitation from the Vatican to speak at a conference on Church and the media. While he was there, he decided to record a podcast of Pope John Paul to show the conference how you could make one so easily. But while he was there, John Paul became sick and was rushed to the hospital. On a reflex, he jumped in a cab to the hospital and began recording an audio diary of those days. He put that online and within a couple of days he had thousands of listeners around the world. People asked him to tour Roman sights and explain them so he began doing that. After John Paul recovered, he returned home. But not long after, John Paul fell sick again and Fr. Roderick wanted to be in Rome at that moment when the Pope needed. He was in St. Peter’s Square the night John Paul died and was continuously recording as it happened. This was unlike anything that was being done in the regular media. He was a priest giving his personal take on the events, not a reporter doing a stand up. He was also there during the conclave when Pope Benedict XVI was elected. That was the beginning of SQPN. Scot asked him what it was like for him when he heard Pope Benedict’s name announced after the election. Fr. Roderick remembers how excited he was to hear Cardinal Ratzinger’s name announced. He recalls being able to get inside the Vatican before the conclave to interview the cardinals. So he went in where the priests were allowed to go to concelebrate Mass at noon and then was standing in the place where the cardinals gathered during their lunch. He met Cardinal Lustiger of Paris and Cardinal Ratzinger was there and said at the time saying that he could be standing in the presence of the next Pope. Because Fr. Roderick has a responsibility to his parish, he needed to make other kinds of programs than travelogues to draw people into the life of the Church. So he went back to his roots in the Star Wars blog, and thought about audio programs on topics like Star Wars and J.R.R. Tolkien’s Lord of the Rings and even Harry Potter, which was controversial at the time. He saw how he could use those topics to talk about the Catholic symbols and themes within those works. He called the first series, The Secrets of Harry Potter, and immediately had a huge audience. Just a few years ago, Dan Brown’s Da Vinci Code was all the rage and then his book Angels and Demons became a movie too, so he decided to expose the ridiculousness within those books. He went to Rome for one day, starting at 6am, and went to all the places described in Dan Brown’s books and told the real story of them. He made thirteen or fourteen episodes of an hour each. He called it the Secrets of Angels and Demons. Apple put that series on the front page of the iTunes store as a recommended pick and he had 50,000 people who’d never listened to what he’d done before. Many of them came into other programs and became part of the SQPN community. He’s heard from many people who started listening to his first episodes of Harry Potter and Angels and Demons who have since converted with their whole families to the Catholic faith. Our prize this week is a copy of the EWTN DVD Crossing the Goal: Our Father, featuring Danny Abramowicz. This week’s winner is David Kirby from Lynn. Congratulations David! 5th segment: Scot asked how many programs Fr. Roderick has done and how many he’s currently doing. Fr. Roderick said on the weekends he’s busy celebrating Mass at all his parishes. During the week, he has three different jobs in media. In addition to the podcasting, he has a television show on Catholic life in the Netherlands and a radio show, both in Dutch. On the other days, he does his podcasts, including the Break, in which he talks about anything he’s passionate about, including movies, TV, computers, and more. He produces two Tolkien-based shows, including the Secrets of Middle-Earth where he talks with co-hosts about the writing of Tolkien while they “walk” around in the online game about Middle-Earth. He also has a show about the production of the two movies about the Hobbit called Secrets of the Hobbit. He also does a show about an online game called Farmville, where they talk about any Christian themes that come about as they also talk about the game itself. They start with something that’s popular in modern culture, and do the show with faithful Catholics, and by an invisible process that Catholic identity comes across. They build a friendship with the audience, which is the cornerstone of evangelization. If you trust someone, you trust the faith and ideals of someone. He does a show called Health and Holiness, combining the topic of becoming fit physically and spiritually. It started when he started training to run a marathon. the Catholic approach to health concerns all aspects of life, including the spiritual. We’re called to become saints, so the show is a progress report on the work to become a saint. Fr. 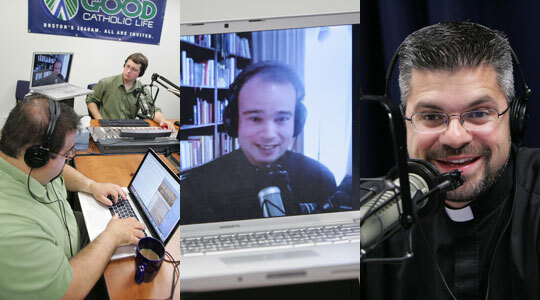 Matt asked how priests and parishes could better utilize new media to reach out and better evangelize their communities. Fr. Roderick said it’s the same advice Pope Benedict gave when he encouraged priests not to think of new media as something not for them. We need to give a heart and a soul to the Internet. You don’t have to force yourself to learn all kinds of technology that aren’t you. The moist important thing is to be out in the social networks as a priest in a personal way to help people, to be with them, and to share their life with the people. He’s found his own parishioners who might be old and not tech-savvy and they connect with the personal life he shares with them. Young people are looking for models of identification. They need to see the personal face of the Church in the priest and if they see a priest concerned.